The Brooks United Methodist Church Project: We worked with Church Development Services LLC, the design-build contractor for the new church facility. 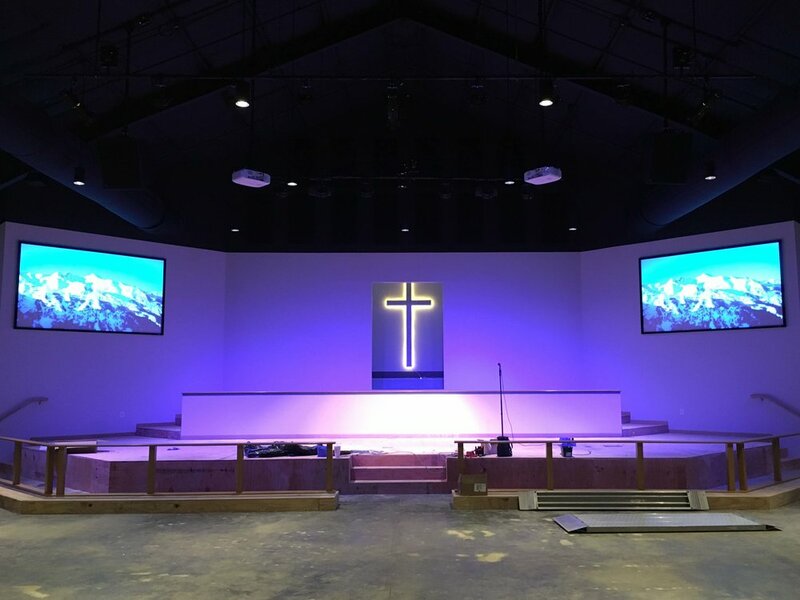 On this project we worked closely with the church worship committee to accomplish their goals, and meet their needs for design and installation. Even with a complex Audio, Video, and Lighting design, we were able to teach and instruct volunteers to operate each of the systems. 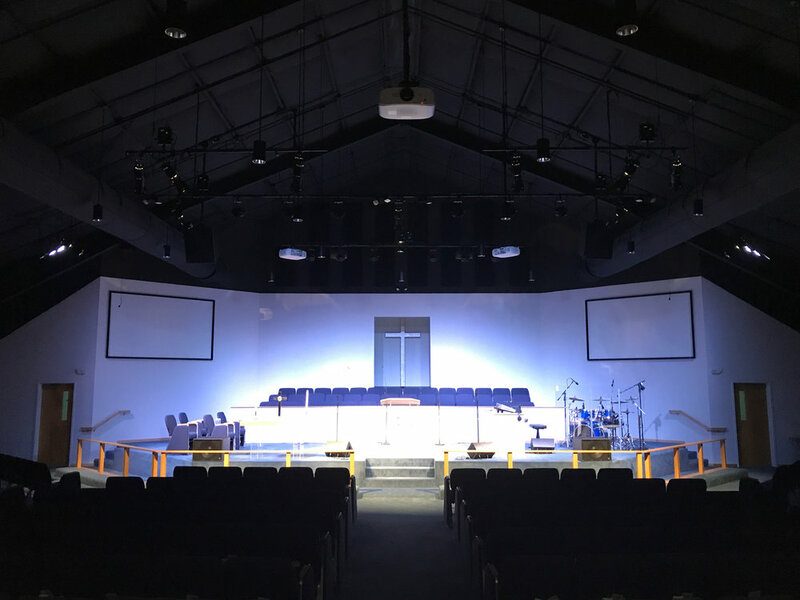 We also designed and installed a complete audio and video distribution system, so the Sanctuary cameras can be viewed in any of the 7 locations, including the fellowship-hall. We also set up a live stream system from the designated video room for viewing anywhere in the world. 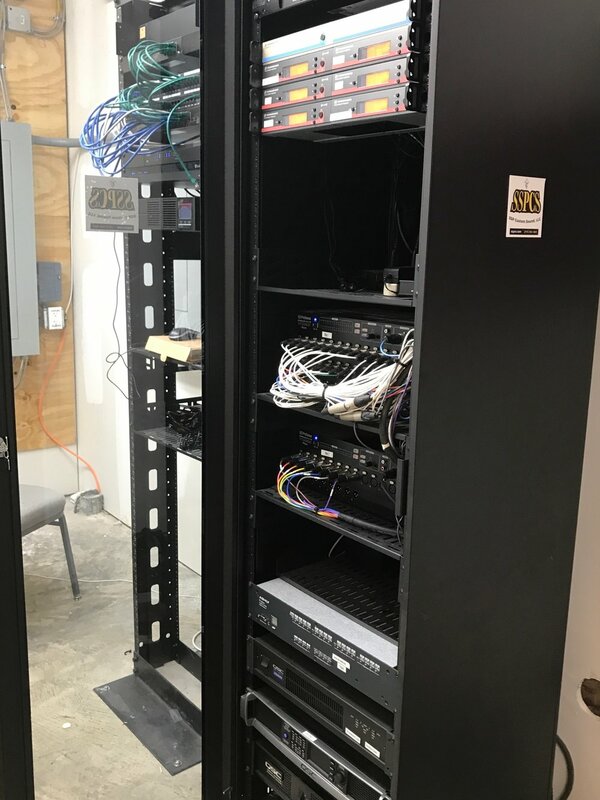 SSPCS installed all of the IT for the church, including wifi access points throughout the building. We topped it off with surveillance cameras covering the outside of the building and parking lots. 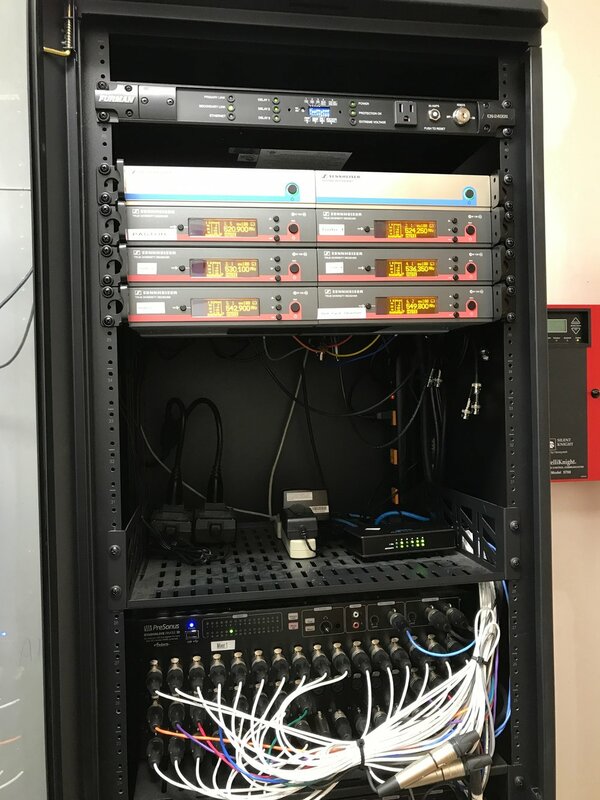 We monitor the IT and surveillance remotely for the church, and do updates and maintenance for the system off site. First service at new facility. Yes they love the color blue for there stage. Presonus digital console and iPad app controlling the audio. Sound booth where lighting console and Pro-Presenter software is controlled from installed IMac. Testing the stage lighting and projector feeds. Josh teaching volunteer staff how to use the video system. Video room where it all takes place. Yes there is a lot that you don't see that makes it all work, only a installer could love. From the ceiling hangs Worx Audio X3 line arrays along with X115 sub-woofers, which gives the room excellent audio clarity and coverage. Three HD video projectors, give the stage and rear screen high quality video. A better view of the line arrays and early stage lighting. More stage lighting was added, after the project completion. Client wanted surveillance that could be seen on mobile devices, in and outside of the church facility. SSPCS monitors all IT and survallance for the church off site. Yes we love to show the work done to complete the systems that most never see. 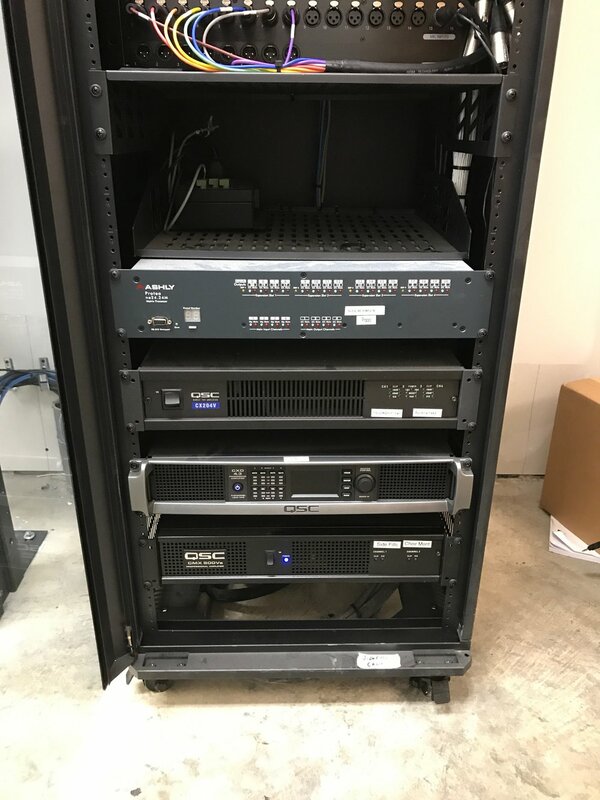 IT rack with surveillance and where building networking is controlled. Power amps for parts of main audio (subs and side fills) and building audio distribution. Main X3 line arrays speakers are powered with internal amps and processing. Sennheiser wireless with antenna distribution along with 48 channel Presonus Rack mixers controlled with CS18 interface at sound booth. System is powered on with Furman Power sequencing system that turns on Sound booth, Main speakers, and Racks in proper order all controlled by a key switch at the booth.